Members in Attendance: Cynda Herrick (Secretary, VP), Nicole Musgrove, Patty Wold, Linnea Hall (telephonically), Dave Bingaman, Heather Soelberg, Gene Tyler, Blake Watson (telephonically), Lindsay Harris/Jill Chapman, and Thom Sowers and Andrew Mentzer (Executive Director). Members Absent: Sherry Maupin (President), Julie Good (Treasurer), and Eric Borchers. Guests: Delta James (City of McCall); Eric Forsch, Jerry Miller, Tom Kealey (Dept. of Commerce); Alex Lytle (Developer); and, Tom Reinhardt (CEO of Cascade Medical). McCall Chamber official appointment: Jill & Lindsey – Nicole moved to accept the McCall Chamber appointment of Jill Chapman and Lindsay Harris as their shared representatives. Gene seconded the motion. Motion carried. A&Z Construction–Donnelly Housing, 48 units: Alex stated that he would like to develop 48 units that are less than $200K, 2 bedrooms, garage or carport, etc. The site is located in an opportunity zone. Each unit would be a minimum of 900 sq. ft with deed restrictions. He has met with the cities and fire department. Will be submitting the application to Donnelly. Considering other parcels and configurations as well. Idaho Dept. of Commerce team: Tom Kealy – Director, Dept. of Commerce; Eric Forsch – Business Retention & Expansion; and Jerry Miller – Training, were present. They introduced themselves and stated they are available as a resource and support for regional efforts. Board training with Jerry Miller: Jerry did a training on board responsibilities. (see attached) Would like to do new member packets and fundraising training. Treasurer’s report: Gene moved to approve the Treasurer’s Report. Patty seconded the motion. Motion carried. 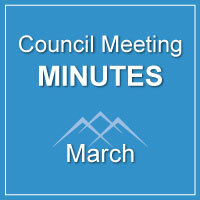 Approval of Feb. minutes: Heather moved to approve the minutes. Dave seconded the motion. Motion carried. Letter for McCall Community School: Andrew read the letter, stating neutral position (we have made resources available, per their request). Gene moved to approve sending the letter of support. Patty seconded the motion. Motion carried. Legislative opportunity: Risch and Crapo on scenic byways – Andrew looked into legislative advocacy options available that would be compliant with our 501c3 status. Looked at housing, but nothing on the roster that would be especially impactful. Noted legislation about urban renewal if individuals would like to get involved. Letter sent to congressional delegation in support of scenic byways. March 19 is the scenic byway meeting. Training: Idaho Power grant $750: Idaho Power approved grant for attendance at the NWCDI and IEDA (Fall) conference. Bylaws signatures for posting to website: Will be getting electronic signature invite in ten to twelve days, if viable. If not, we’ll get signatures the old fashioned way. Printing of new brochures: Idaho Power may print the new brochures. Blake submitted to their print shop for authorization. Dargui J1 opportunity: Andrew met with Dargui team from Peru about student J1 work exchange program. Has sent the opportunity to some employers in the area. If others might be interested in hiring J1 seasonal labor, we can connect them. $1,500 authorization for culinary cohort program–likely reimbursed through McCall 2019 contract: 2019 strategy launched due to demand and discussions with partners. It is in front of McCall City Council for approved funding, Dept. of Labor, University of Idaho are partners. There will be 3 introductory classes in the culinary arts, plus a food handler’s license. It is an $80 application with the possibility of scholarships. Total of 20 people in the class, will be held at the McCall Community Center. End result is a certificate and food handler permit from CDHD. Nicole moved to approve funding for $1,500. Gene seconded. Motion carried. Will be presenting the feasibility study to the Board of County Commissioners. Also to the Valley County Fire Working Group. o Culinary apprenticeships: working with a couple different businesses. o BSU grad students–Gap analysis 2.0 update: still working with superintendents in the 3 districts; will prescribe CTE; FFA or Ag Education; automotive; the Trades, alternatives and apprenticeship. o Northlake Sewer upgrade update GEM grant – the district is requesting an additional $15,000 from the county. o Yellowpine water GEM grant – under revew.